Remove high-affinity antibodies from membranes so they can be reprobed and detected with chemiluminescent substrates. 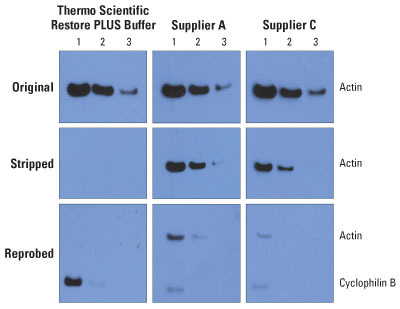 Restore PLUS Buffer is an alternative formulation of the original Thermo Scientific Restore Western Blot Stripping Buffer. Restore PLUS Stripping Buffer was designed for use with antibodies that are difficult to remove from Western blots and require longer incubation times or incubation temperatures greater than 22°C with gentler formulations. High-affinity antibodies can be quickly and effectively stripped from Western blots at room temperature without removing transferred proteins, thereby allowing multiple reprobes of the target. 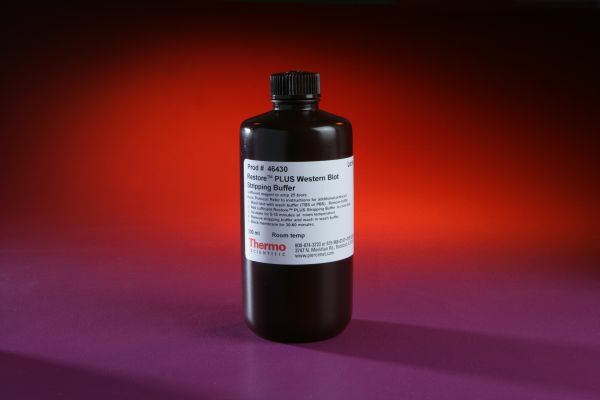 Restore(tm) PLUS Western Blot Stripping Buffer, 500 mL. P390-Absorber el vertido para que no dañe otros materiales. P234-Conservar únicamente en el recipiente original.